Scottish Terrier Rescue Northwest (STRNW) located in Washington state, is an all volunteer organization dedicated to the care and placement of Scotties in need of new forever homes. Scotties that come into our care are health checked, treated for any existing medical conditions, vaccinated, micro-chipped and spayed/neutered. STRNW does not place intact Scotties in adoptive homes. The Scotties in our care are generally in good health and we do not place dogs that are ill or injured. Though they are few, there are always the sad cases of neglect, abuse or abandonment. Because we are a rescue, we treat, care for and nurture these special cases until they are fit to be placed in a new home. The majority of Scotties that come into our care are owner surrenders. These are generally adult dogs that are parted from their families for a variety of reasons. Adopting an adult Scottie can be especially rewarding and often bypasses the hectic puppy stage. Although these are often beautiful dogs they are not show dogs and in the majority of cases they are undocumented and their pedigree is unknown. Our Scotties are meant to be family members, to be loved, cared for and admired for just being a Scottie. As our name implies, we operate in the Northwestern U.S. In special cases we have received Scotties from as far away as Florida but we do not ship Scotties out of our area. The logistics of shipping a Scottie are difficult and expensive, but our main concern is that we would be unable to meet potential adopters in person and visit their homes. We would be unable to adequately ascertain if we were placing a Scottie into a safe and caring environment. We do have the ability to refer potential adopters to Scottie Rescues in other parts of the U.S.
Scottish Terrier Rescue Northwest, is a Washington state Non-Profit Corporation 501(c)3, is a public charity, founded and maintained through general public support for the prevention of cruelty to animals, specifically the Scottish Terrier breed of dogs, by the rescue, care, and placement of unwanted or abandoned Scottish Terriers. Our Northwest coverage area includes: Washington (Eastern and Western), Montana and Idaho. 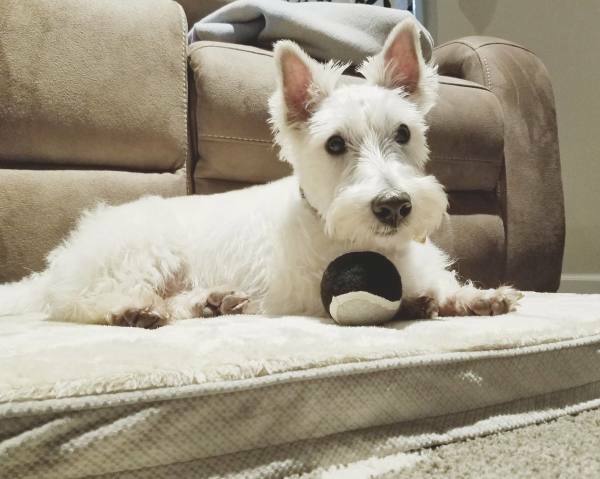 The Scottish Terrier Rescue Northwest organization was formed for the rescue of Scottish Terrier dogs that are still looking for their “forever” homes, and caring for quality pure-bred Scottish Terriers. We are committed to protect and advance the interests of the breed, and to provide information about the breed to Scottish Terrier fanciers and the general public.